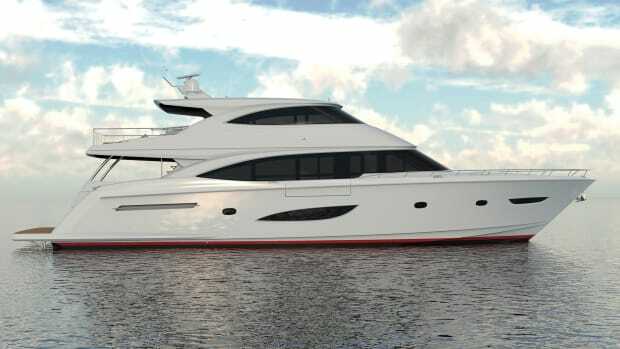 Viking returns to building motoryachts with a new 93-foot flagship that’s capable of cruising to far-flung locales. 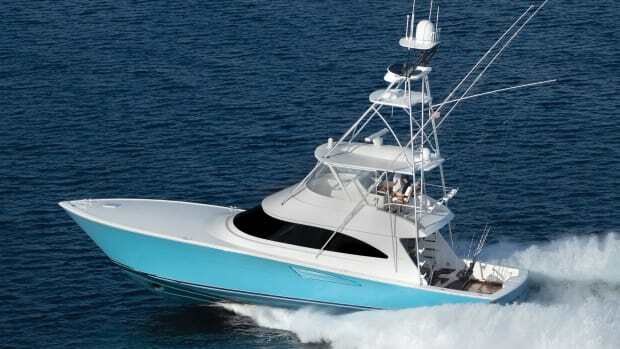 At 93 feet, Viking’s newest motoryacht is big in every way, and bred from a sportfishing heritage. Viking is back and bigger than ever. Although, with a 53-year history of continuous operation, Viking has never actually gone away. 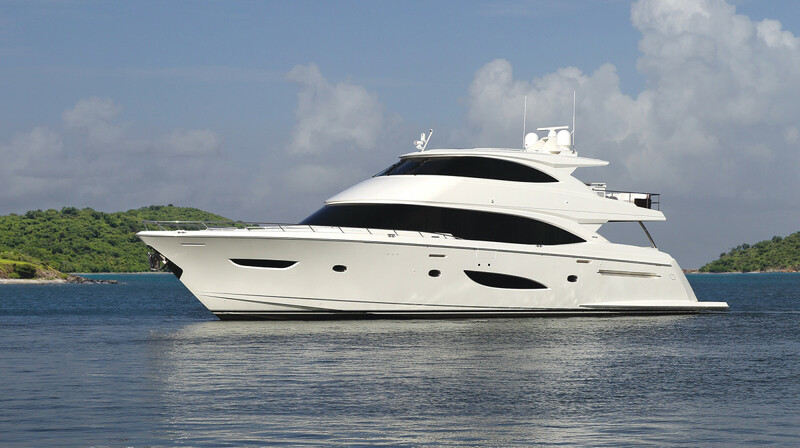 It just stopped building motoryachts for a while, but returned with a vengeance. 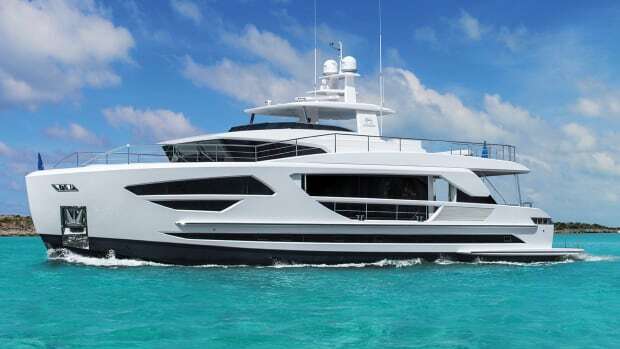 The new 93 Motoryacht is the largest yacht ever made by the New Jersey-based builder. 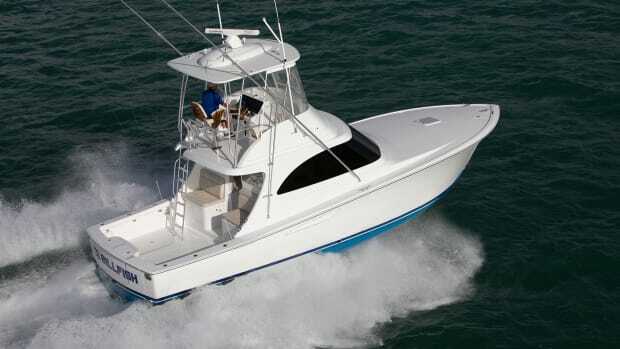 Viking, of course, is best known for serious sportfishing war wagons and, when the boating market slumped, it focused on its bread-and-butter convertibles. The last motoryacht was built in 2001 (a 60 Cockpit), but 14 years later Viking re-entered the serious cruising market with the 75 Motoryacht, followed by an 82-foot cockpit version. 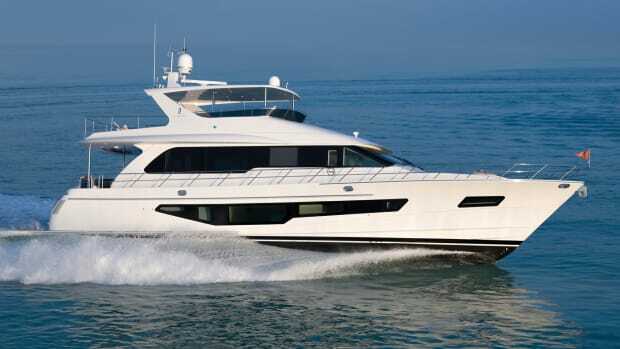 Yet Viking CEO Pat Healey had grander plans, and took two and a half years to craft this new 93-footer. The starting point is a slippery Mike Peters’ hull with a classy profile that is going to remain in vogue for years; and the hull is filled with five staterooms and seven heads—and, by my count, no fewer than 14 barstools at three bars plus the galley counter. Add to that list 12 TVs. This is a yacht for entertaining. It’s also a yacht for serious dining, with three tables plus the eat-in country galley (not counting the crew mess). For alfresco meals, go to the after deck; a formal dining area for eight is in the salon and an airy dinette is in the galley under the windshield. 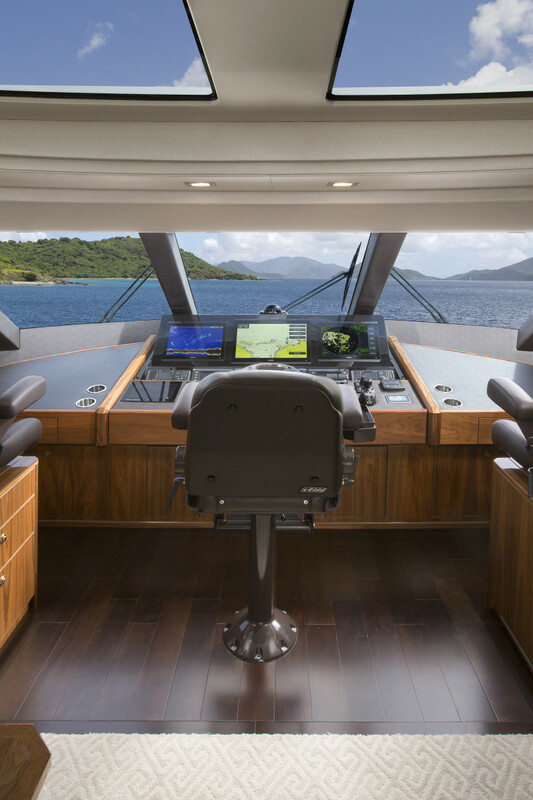 The 93’s interior, by WBC Design, is warmed by a glossy walnut, with teak as an option. Soles throughout are Avalon engineered flooring for good looks and long wear. When it came to counters, tabletops and heads, Caesarstone was the choice, and Viking used a range of colors and striations from Emperadoro to Statuario Nuvo. The salon is arranged with the entertainment lounge aft to double as a media room facing a 65-inch pop-up TV with a mix of loose chairs and built-in couches. 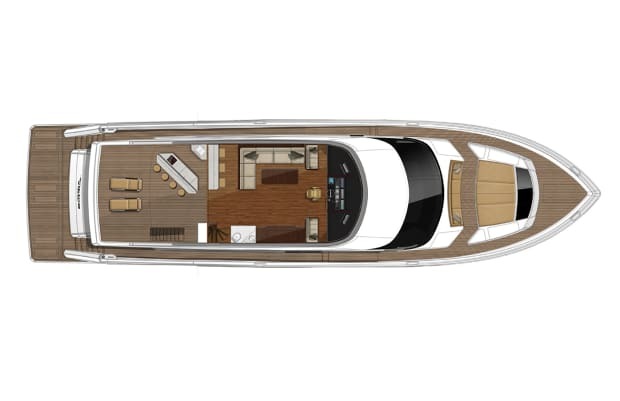 This opens directly via a husky four-panel slider to the aft deck with built-in bar and dinette. But this isn’t the only salon access to the outside world. To starboard are hydraulic sliding doors opening to the side deck, where the bulkhead folds outward to create a pleasant sitting area for a couple of chairs. It’s well conceived, with the bulwark hinging up and down at the touch of a button, plus dedicated stowage for the pop-in rails to keep you sipping rather than, well, swimming. Subtle and thoughtful touches are the cutaway coamings on the port side so that guests in the salon have full visibility even when seated. The galley is a classic country kitchen, designed for everyone to hang out and perhaps even help the cook. It’s a slightly odd layout (to my mind) with the four-burner cooktop aft and the sink all the way to port next to a hydraulic pantograph door to the side deck. The center island is all counter space, but there’s no missing the massive 7-foot SubZero fridge/freezer against the aft bulkhead. There’s also a day head tucked to starboard, which, with its large window, is a loo with a view. But no matter how good the 93 MY is at eating and drinking, it’s even better at sleeping. The master stateroom has its own private entry from aft in the salon, and this suite spans the full beam with a centerline king berth, vanity/bureau to port and a large table to starboard­—large enough for more than just croissants and coffee. For some (you know who you are), the high point of the owner’s area will be the full walk-in closet, while others may beeline to the head with twin sinks and a shower. Whatever the preference, the stateroom has tear-shaped windows on both sides, and a 65-inch TV on the forward bulkhead is like a drive-in movie screen. A stuffy helm is damn near impossible on the enclosed bridge, what with its electric sunroof. While you’re there, check out the sightlines. Forward, the guest cabins are reached via stairs from the galley to a lower foyer. Forward is the VIP suite with island queen berth and en suite head, with a gorgeous underwater scene in etched and backlit glass by Christopher Channell above the headboard. As in the master cabin, the berth here hinges up on lifts to provide added storage. To starboard off the hallway is a cabin with upper/lower bunks, perhaps best for kids; it can also be outfitted as a private office for the owner. Two more en suite guest cabins are aft and these are like the bonus rooms in a house: Configure them as you wish. On our test boat, there was a double berth in the port cabin and a pair of singles to starboard, both with private heads with showers. And, making life for the crew easy, a stacked washer/dryer is hidden off the hallway. Speaking of crew, oh my! What a pleasant area has been staked out for them. 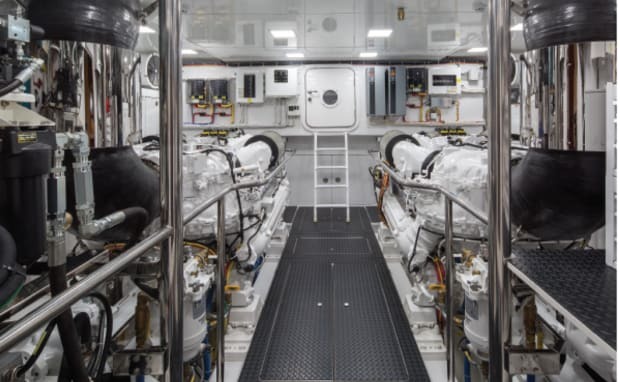 Two private crew cabins are positioned forward of the engine room; they share a head with full stall shower, and the level of finish is the same as in the guest areas. A dinette with table works in tandem with the mini-galley to make the crew independent, and access is safe and secure via stairs from inside the protected after deck. 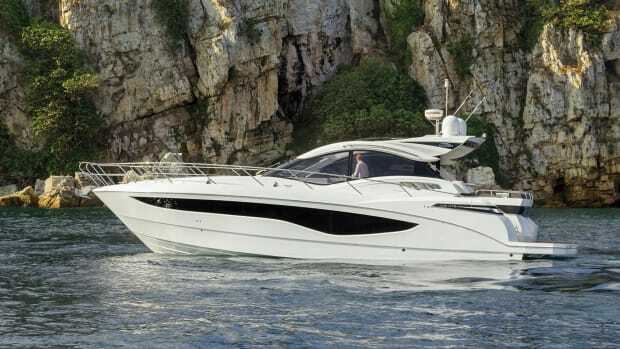 The 93 MY is standard with the skylounge, so it’s not some clapped-on addition to a flybridge. The centerline helm is forward, flanked by double Stidd companion benches, and an L-shaped settee with coffee table completes the port side. To starboard is a console with pop-up TV and another day head saves some walking. 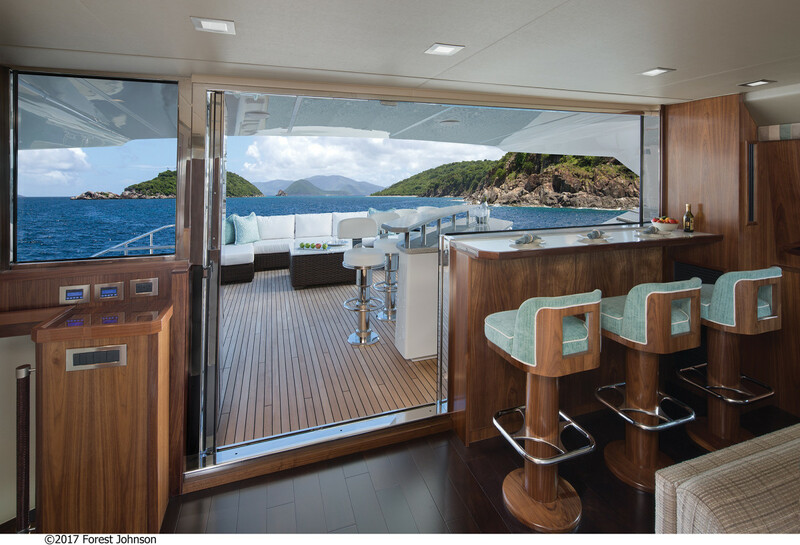 A thoughtfully designed feature is the aft powered window, which lowers into a cabinet to create a two-sided bar area on the upper deck, which is ready for a squadron of chaises. For a sunpad, head for the foredeck, where there’s also a couch. You can camp all day up there, since it’s equipped with a fridge, stereo and lightweight sunshade. A nice touch in the skylounge is twin stairs: one between the upper and lower afterdecks (in case you’re wet) and one inside the skylounge to the salon for all-weather use in any season. 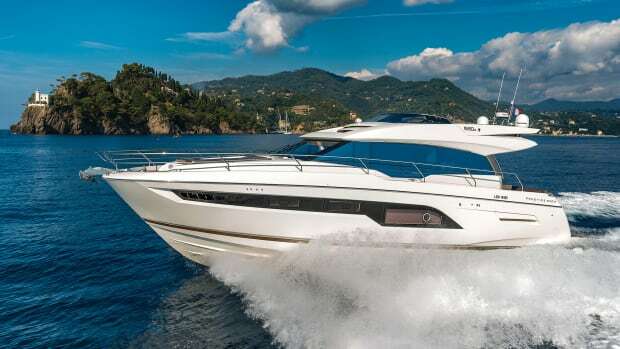 Some owners may head straight for the engine room, where they will find those massive MTU Series 2000 V12s of 1,945-horsepower each and—this was a surprise—you can walk completely around them. 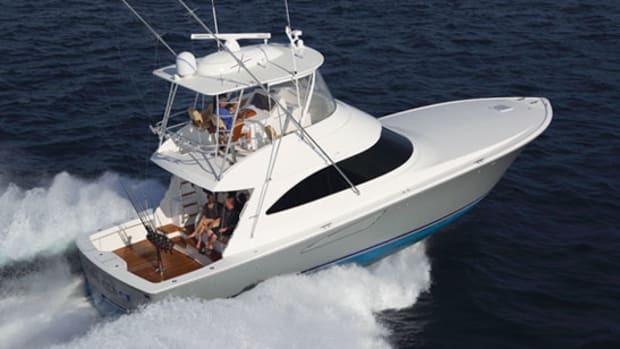 Viking conceived a masterpiece exhaust system that arches above the outboard walkways on each engine, allowing service without climbing over or around. I cannot imagine what this must have cost, but it’s a brilliant solution and your service techs will love you. Guests dining alfresco on the skylounge’s aft deck could keep the barkeep busy, judging by all those seats. 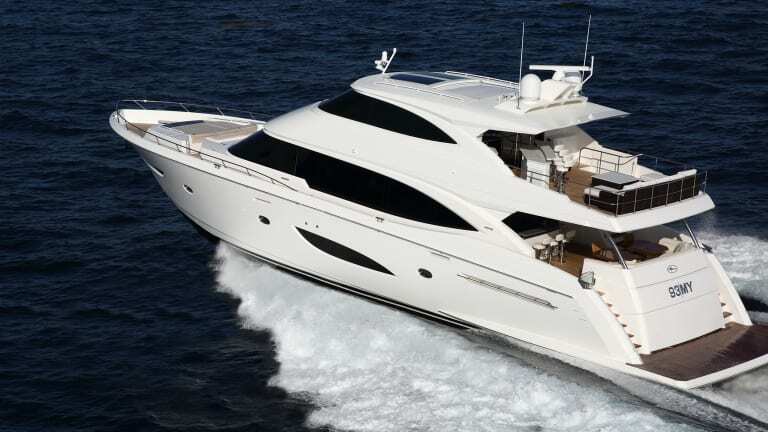 Even better, every piece of piping, plumbing or electrical is labeled and impeccable; a workbench with toolbox is forward next to the door to the crew quarters; and the yacht benefits from both AC power management and an ASEA converter. Our particular 93 MY had been upgraded to a pair of Cummins Onan 55-kilowatt gensets, and a Seakeeper 35 was also readily accessible. Skippers will like the two docking stations that fold out in the cockpit. When using the starboard station, the skipper can refer to the wall-mounted television with the camera on the port side for a full view of both sides of the vessel. Bow- and stern-thruster jog sticks complete the handling package. Abaft the engine room is a garage capable of handling a 13- or 14-foot tender, with a hydraulic door to the swim platform and rollers for easy launching and retrieving, plus stowage for water toys. The war wagon simile is apt because, underway, the 93 MY had all the “feel” of a big convertible sportfishermen. She was far more nimble than I’d expect from a 57-ton motoryacht and, while we were pulling 98 percent engine load at full throttle and 27.1 knots, she still had surprisingly long legs when you backed off. At 80 percent load (2350 rpm), which would give those MTU diesels a long and happy life, we were still doing 23.9 knots. With twin cockpit docking stations, close-in visibility isn’t critical from the upper helm, but I did find the four large mullions supporting the windshields to be a distraction from otherwise fine visibility. 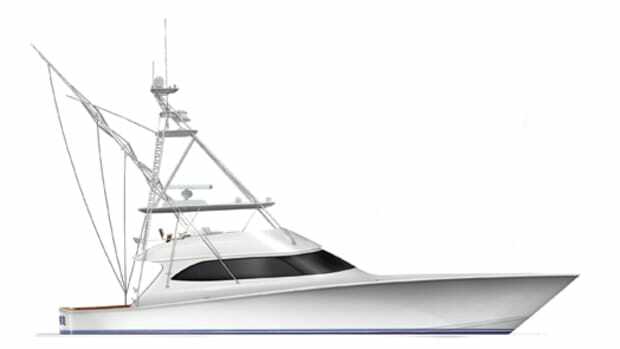 Viking has gone for high-tech construction and, having just launched the largest resin-infused sportfishing boat in the world (a 92-footer), it’s no surprise the company carried that same technology to the 93 MY, with a mix of conventional fiberglass and carbon fiber fabrics in high-stress areas, all infused with an end-grain balsa coring. All told, the 93 MY is everything you’d expect from a Viking: big, fast, luxurious and expertly built. Test Conditions: Temperature: 80°F; humidity: 75%; seas: 1-2&apos;. Load: 1,000 gal. fuel, 100 gal. water, 5 persons. Speeds are two-way averages measured with Garmin GPS display. GPH taken via MTU engine display. Range is 90% of advertised fuel capacity. Sound levels taken at helm. 65 dB(A) is the level of normal conversation.